Ross is correct. If Seattle is willing to devote one-half the capacity of 1st Avenue to the CCC Streetcar with 12 trips per hour per direction, it should be willing to devote it to say 40 bus trips per hour per direction and provide much shorter waits for local circulation. The streetcars are over very costly circulators. With the AWV closing the the transit tunnel about to be prematurely closed to buses, it would be much better to use 1st Avenue for existing and funded bus trips rather than yet to be funded streetcars. the connections that could be provided by the CCC are already provided by the LInk and bus network. the local capital would be much better used on several other projects (e.g., sidewalks, RapidRide, trolley bus overhead). Durkan has to clean up the mistakes of mayors Nickels-McGinn-Murry-Burgess. How much of the cost increase was due to the 6-month “pause”? 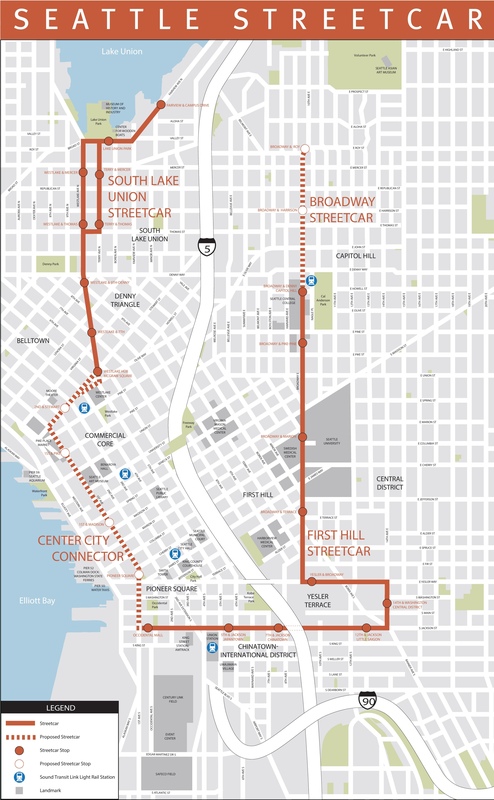 >> They also say that a continuous loop connecting First Hill, South Lake Union, and downtown will create a convenient, predictable one-seat route between those destinations. Well then they flunked geography (or geometry or maybe both). With so much focus on the mode (streetcar) there is way too little attention being spent on the route. Here is a map of the proposed extension: http://ontheworldmap.com/usa/city/seattle/seattle-streetcar-map.jpg. This includes a longer section on Broadway, which will likely never happen, because — like most of the city — the folks on Broadway think the streetcar is silly, and don’t want to see the streets torn up for such silliness. What is clear by looking at the route, though, is that it is essentially a loop (an open jaw, if you will). This isn’t good. There is also a very peculiar section around Yesler (a button hook). This is worse. Transit experts have criticized loops (https://humantransit.org/2013/08/translink-high-and-low-performing-routes.html) and circulators (https://humantransit.org/2009/04/seattle-transit-blog-is-reporting-some-grief-from-the-rainier-valley-area-in-southeast-seattle-regarding-king-county-metros.html) and this happens to be both. Why the hate? Because they don’t work for even moderately sized trips. This will go from First Hill to South Lake Union, but no one will ever take it from First Hill to South Lake Union. You could walk there faster than that. But it gets worse. From First Hill to First Avenue doesn’t make sense either. From Yesler Terrace to First and Yesler, it is actually faster to walk. Seriously. Check Google, and that walk is faster than a trip from Yesler Terrace to First and Jackson (and that doesn’t include the part that isn’t built yet). If that little segment is really slow, then by definition, other combinations are slower. Trying to get from Harborview to First and James? Take the 3 or the 4. Want to go from Broadway and Madison to First and Madison? Take the 12 for now, but eventually you will take the Madison BRT. Seneca? The 2 is much faster. Pike/Pine? Take your pick between the 10, 11 or 49. John? Come on, just take Link. If built, this will forever be slow for even trips of moderate length (a mile) while there will be much better options elsewhere. Eventually, as the city continues to grow its transit system (adding more bus service and Link) it will become obsolete. Better options will exist and it will become merely a tourist attraction. Kind of like the bubbleator, only not nearly as cool (I miss the old bubbleator). Huh? “Proponents of the downtown streetcar have argued that linking the two lines with a grade-separated downtown connector will dramatically boost sagging ridership…” Where’d this come from? There is NO grade-separation proposed anywhere for this streetcar project. None. Nada. All of it runs at-grade in city streets. I’ll edit to say “dedicated right-of-way” to be more specific. But the point they are making is precisely the same, regardless of the specific language: The downtown streetcar would not run in the same lanes as regular traffic, unlike the existing two streetcars. It will have some dedicated right of way, but the new 1.2 mile section won’t be completely separated from traffic. At least that is my understanding. Much of First Avenue, but not the connecting piece. It would be interesting to dig into the details (hint, hint). Exactly how much of the new routing will be exclusive? Regardless of what you think of whether ten foot cars can use the same turn radius or national rail weight bearing standards as what the rest of the nation uses, or the fare box underrun, or the construction overrun, or even the routing; Seattle’s Downtown Streetcar project is an ecological triumph for the whole city. Why, you ask? Because, as noted by Erica, the projected is not being “engineered” by the UW Engineering Department (who might even have a clue about such things) but by a PR firm run/owned by Jenny’s friend and the Deputy Mayor’s wife – likely for some serious bucks. That means this “thing” smells like rotten fish and if we are recycling rotten fish to fuel this project what a great “win” for those of us who believe in recycling to the max. “Who da thunk it” that Ballard’s Swedish and Norwegian ancestry fishing fleets would turn into such a golden fuel supply. Side note: having worked for the Feds for 30 years or so, both the fact of corruption or the “appearance” of such is a court martial or firing offense. So I would think that the President and his DOT, from whom Seattle is begging for $75 million, are gonna be legitimately reluctant to feed an “apparently corrupt” project for which they are already politically reticent? C’mon, Jenny, you were a DA, and this is NOT Huey Long’s Louisiana or Richard J. Daley’s Chicago. It’s time to stop this fixed mode of transportation. Smaller buses running frequently with flexible routing, could make a big difference. And without question, the rails make bike riding more difficult and dangerous.